This time last week I was in Worcester, at the Worcester Literary Festival. I had never visited Worcester before but there was no time to explore this attractive city, so I have promised myself another visit in the near future. The festival ran from 20-29 June, with the theme this year of the 1st World War, to mark the centenary. After lunch with my writer friends Morton Gray, Ellie Swoop and O’Dwyer_author we visited the Authors’ Fair at the Guildhall. There were several local authors with stands and we were pleased to meet fellow RNA member Sheryl Browne. My main purpose for attending the Festival on Saturday, however, was the Romantic Novelists’ Panel which was held in the lovely St Swithun’s Institute. 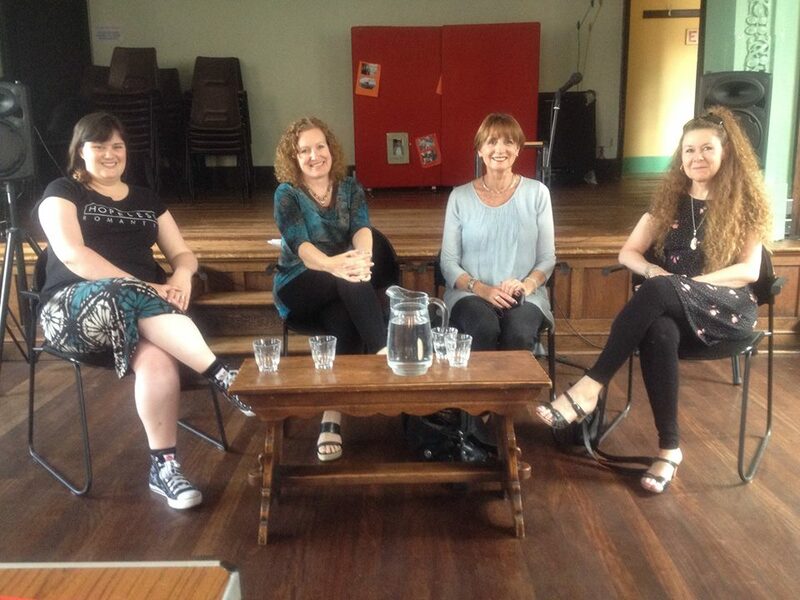 Alison May, a Worcester author and on the far left of the photo below, chaired the panel which comprised, from left to right, three prolific romantic novelists: Sue Moorcroft, Liz Harris and Christina Courtenay, all of whom – together with Alison – are published by Choc Lit. The three panellists all had copies of their books for sale, and I couldn’t resist buying a book from each of them, and getting them signed! Somehow, I don’t think HMRC would view those as tax deductible. Shame! The audience was small, consisting mainly of writers or aspiring writers, with at least one blogger/reviewer (see later!). It proved to be an informative, fun session, with Alison very ably leading the panel through a series of questions before taking questions from the audience. The panel coped admirably with the very real danger of strangulation by the microphone lead and both informed and entertained us with anecdotes from their writing lives, along with interesting snippets about their attempts to get their first publishing deals. On a personal note, I was interested to hear that both Christina and Liz started out with the ambition of writing for Mills and Boon but found that it was not as easy to get accepted as they had thought! It was fascinating to hear the different plotting, writing and editing processes discussed. It goes to show there is no ‘right’ or ‘wrong’ way to write a book. If a process works for you, then it is right! I was particularly interested in the discussion about setting. Christina, having lived in Japan, used that knowledge to good effect in some of her books, including The Scarlet Kimono; Sue has invented a fictional village called Middledip – with other surrounding villages and towns – which she has used in Starting Over, and several other novel; and Liz recounted her efforts to find something unique for her first book, and how she discovered a place called Ladakh in India, which provided the setting for The Road Back. The session finished with coffee and truly scrumptious cakes; much kudos to whoever made the to-die-for brownies! It was lovely to meet some of the other members of the audience, including Sarah Broadhurst, who is a prolific blogger and book reviewer (Sarah’s Book Reviews) and who very kindly accepted a copy of Mary and the Marquis to read and review! I was also delighted to meet Georgia Hill and Elizabeth Hanbury, both of them published authors and members of the RNA and both of whom I ‘know’ online via Facebook, but had never met in person. It was a lovely way to spend an afternoon, and I left feeling both uplifted and inspired. I do hope Alison (who put much time and enthusiasm into this event) will have the energy to organise a similar panel next year. I, for one, will be sure to attend. This entry was posted in Writing and tagged Alison May, Christina Courtenay, Liz Harris, RNA, Sue Moorcroft. Bookmark the permalink. Sounds a brilliant way to spend a day, Janice.